Figure 1: The deep blue 98.57 ct Bismarck sapphire is from Myanmar (formerly Burma). Photo by Chip Clark, Smithsonian Institution. Most people hear the word “sapphire” and envision a beautiful velvety blue gemstone such as the center stone in the Bismarck sapphire necklace (figure 1). But there is more to sapphire than many people realize, and it might surprise you to find out about its industrial applications, its long history within the synthetic crystal growth industry, where it’s showing up today, and where you might see it tomorrow. Figure 2. Left: In this model of corundum’s crystal structure, the purple and gold balls represent aluminum and oxygen, respectively. The pink shadowing shows the octahedral coordination of aluminum. Right: A hexagonal representation showing the c and a planes. Sapphire is a variety of the mineral corundum, also known as aluminum oxide (Al2O3). Corundum crystallizes in the trigonal crystal system and is normally described using hexagonal axes (figure 2). It can assume a rainbow array of colors given the correct trace impurities and growth conditions (figure 3). In addition to blue sapphire and red ruby, corundum also includes “fancy” sapphires of every other color (including colorless). Sapphire and ruby are found all over the world, with notable sources in Africa, Asia, Australia, North America, and Europe. Figure 3. These sapphires in a rainbow array of colors are from GIA’s Dr. Eduard J. Gübelin Collection. Photo by Robert Weldon. Sapphire has a melting point of 2040°C, a high hardness of 9 on the Mohs scale, and a substantial refractive index of 1.76 to 1.78. When no impurities giving it color are present, sapphire can make a wonderful optical window material since it’s transparent throughout the entire visible range, and far into the UV and IR ranges as well. With such properties it’s no wonder sapphire has been such a treasured gemstone throughout recorded history. These same properties have also made it very attractive for non-gem applications as well, and some of the most sophisticated synthetic crystal growth and processing techniques to date have resulted from demand for these products. Sapphire saw its first industrial application more than 300 years ago, as jewel bearings in mechanical timepieces, where longevity and high accuracy were worth the cost of these durable and low-friction components. The first synthetic corundum, a flux-grown ruby, was produced in 1873. This development was followed by the commercial introduction of the flux-grown Geneva synthetic ruby in 1885 and Verneuil flame-fusion synthetic ruby in 1902. Early synthetic sapphires and rubies were used for gems and watch jewels. Since then, however, synthetic sapphire has been produced by more growth techniques than probably any other crystal. Sapphire is a binary compound with a congruent melting point (at this temperature, the solid turns into a liquid of the same composition), aiding in its applicability to so many growth techniques. Figure 4. Chatham synthetic sapphire, as-grown and faceted. Courtesy of Tom Chatham. Today the flux (solution) and Verneuil (flame-fusion) techniques are still used for synthetic gems and for other applications. During the 20th century, Carroll Chatham developed high-quality flux techniques to slowly grow crystals with carefully controlled properties. Using his specialized processes, Chatham introduced gem-quality ruby in 1959 and blue sapphire in 1975 (figure 4). Flame-fusion techniques have been used to quickly produce small sapphire boules used for jewelry as well as feed-stock for other sapphire growth techniques. Hrand Djevahirdjian began growing crystals using the Verneuil method in 1905, and the Swiss factory he opened in 1914 is still producing synthetic sapphire today (figure 5). Figure 5. Djeva flame-fusion synthetic sapphire and ruby, as-grown and faceted. Courtesy of Hrand Djevahirdjian SA. 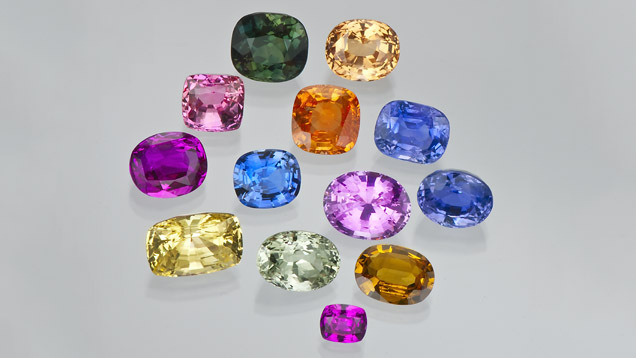 Over time, the matching of sapphire’s desirable optical, mechanical, chemical, structural, and thermal properties to technological applications led to larger, more perfect, and custom-shaped synthetic sapphire in a greater variety of colors. The crystal growth techniques applied to meet these demands will be described in the next installment.